Westfield Football Club was formed in 1953 as Westfield Boys Club, playing in the Woking and District League and also running a youth team. From the start the Club had success in the competitions it entered. Among the trophies won in the early years were the Surrey Youth Invitation Cup in 1953/54, the Surrey Junior Charity Cup in 1954/55 and 1955/56, the Surrey Junior Cup (at the first attempt) in 1955/56 and the Surrey Youth Cup in 1956/57. Following several seasons in local league football, the Club made the break into Surrey Intermediate football using the present ground at Woking Park, Kingfield. Successes soon came and, after becoming League Champions and Cup winners on several occasions in the subsequent seasons, the Club decided to apply for senior status. The application was accepted in 1964 and after one season in the Parthenon League, Westfield met the necessary ground grading requirements and joined the Surrey Senior League. Westfield’s future success in senior football sprang from their ability to attract the best local youngsters, and they were successful in winning the Surrey Youth Cup again in 1966/67 and 1969/70, and the Surrey Youth Shield in 1969/70 and 1970/71. This talent matured and there followed three tremendous seasons for the senior side, when they won the Surrey Senior League Cup in 1971/72, followed by the League and Cup double in 1972/73, and the League Championship again in 1973/74. The Surrey Senior League was disbanded and reformed as the Combined Counties Football League in 1978, and Westfield FC became founder members and have retained membership to date. 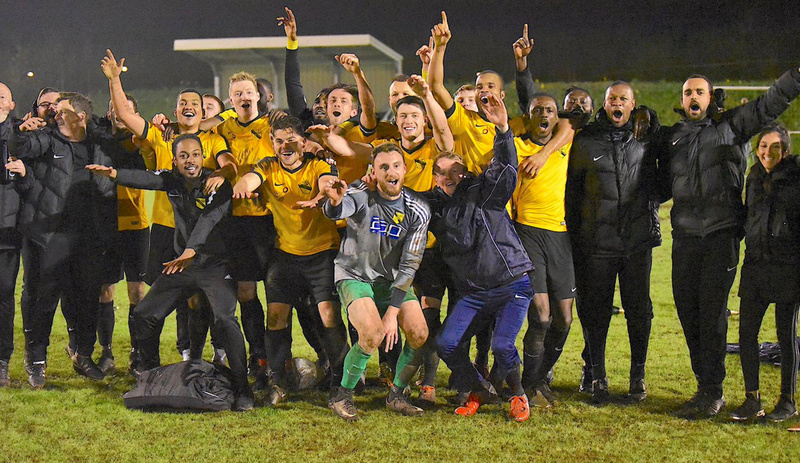 Success, however, has been more difficult to achieve and in recent times the closest the senior team has come to honours was in 1989/90, when they lost the final of the Combined Counties League Cup to Hartley Wintney in extra time. In recent seasons with former Woking player, John Cassidy as manager, the senior side improved their league position, finishing sixth in season 2000/01. That season saw the Club enter the Carlsberg FA Vase for the first time, performing beyond expectations before losing in the Fourth Round to Ryman League Arlesey Town, on the way beating Wantage Town, Lewes and Bowers United. Season 2002/03 saw Westfield enter the FA Cup for the first time, losing at home to Dorking in the Preliminary Round. Westfield continued to compete at youth level and they won the Combined Counties Youth League Cup in 1991/92, as well as being runners-up in the League. Following the installation of floodlights in 1998, the U18 team joined the Southern Youth Floodlight League as members of the Western Division. The Club also run an U16 team playing in the West Surrey Boys League. This is currently the Club’s most successful side, last season competing at U15 level the team won the League Championship, the League Cup and the Surrey County Cup. Following the end of the 2003/04 season, Westfield lost both First and Reserve Team managers. John Cassidy moved to Frimley Green, and thereafter back to Farnham Town, and Graham Pope moved to Godalming & Guildford to manage their reserve team in the Suburban league. Westfield recruited Paul Donaghy from Guildford-based Merrow as first-team manager, and Dave Robson – long-time Westfield player – took over the reserves. At the end of 2005/06 Westfield were relegated to the 1st Division, due to new ground-grading regulations after a very acrimonious conflict with the league. Numerous commitments from league officials were reneged upon, and after months of appeals and meetings, Westfield had to accept their unwelcome fate. After a mid-table Division 1 season and partly because of the league-enforced relegation, Manager Paul Donaghy decided to resign as First Team manager to join Godalming and Reserve Team manager Dave Robson also quit. The team of ex-player Martin Powell, ex-Spurs stalwart David Howells and coach John Comer took over the running of the senior teams for the start of the 2007/08 season. In the close season of 2007/08, following a highly credible 4th place finish, Martin resigned as manager due to personal circumstances; his departure signalled the exits of both David Howells and John Comer. In July 2008 the position of 1st Team Manager was filled by Steve Plunkett, the ex-Godalming Town Reserves boss, though hw was replaced within 4 months by the returning Dave Robson, as the club attempted to rebuild following a mass exodus of players. Dave Robson did a fine job stabilizing the club, but after an indifferent 2009/10 was replaced by joint managers, Craig Moore and John Comer. Off the pitch there was good news, as building of the new facilities commenced in 2010/11 and it promised to be a good season as the management duo assembled the best squad since the 2008 season. However, despite some wonderful results, the team struggled to find consistency, and finished a disappointing 13th in the table. There was better news for the reserves who finished 4th in the reserve league, and reached the final of the league cup, where they went down to double-winning side Mole Valley SCR. During the summer of 2011, Craig Moore decided to step down to concentrate on playing, leaving John Comer as sole manager. He promoted Kevin Bailey from the reserves to be his assistant, and following Dave Kelly’s resignation as reserve team manager appointed David Robertson. In May 2011 the old pitch was dug up and raised a metre, before being re-seeded and in June the old clubhouse was demolished. The club moved into the new facilities in August 2011 with a thrilling opening match in the FA Cup against Peacehaven & Telscombe, in which the Sussex side eventually ran out 6-3 winners, in front of a crowd of 190. The following month a new record attendance for a league fixture at Woking Park was set when 325 witnessed the fixture against Guernsey. The season saw another improvement on the pitch, where a position of 8th was achieved and the team reached a cup final for the first time in nearly 20 years. However they went down 4-2 to Warlingham on the day. The following season the Club gained promotion in third place, and played Walton Casuals Reserves in the final of the Surrey Premier Cup, going down 2 goals to 1 in a close game. In season 2013/14, with John Comer continuing as manager, the Club had their best league finish since 1981, ending in fourth place. With John Comer’s departure, Martin Beard was appointed for the 2014-15 season. After a run of indifferent results, Martin was replaced by Dan Snare, who improved the side to finish mid-table. For the 2016-17 season, Tony Reid was appointed manager, and enjoyed a stunning season, finishing second in the League and winning the League Cup in May. The following season the Club continued to play exciting, attacking football, scoring an amazing 145 goals, whilst only conceding only 45, and became deserved Champions with a fantastic 106 league points. As the 2018-19 season begins, we say farewell to the Combined Counties League after 40 years of continuous competition, and start an exciting journey into Step 4 of non-league football. We wish Tony and his management team well for yet another tremendous season.